Ticks are an integral - and sadly, growing - part of the outdoor environment. Although there’s no way to eliminate them completely, you can take certain steps to reduce your risk. So, enjoy nature, but tread with care. Practice avoidance: Learn about the biology of ticks in your area and avoid areas where and when they are most abundant. Our Tick Documents page provides reference materials to help you learn more about ticks and tick-borne diseases. Enjoy nature, but be aware of creatures that may be looking for you, whether it is a tick, mosquito, or other creature that would find you attractive! Evaluate your home and landscape: Rodents visiting or nesting in the walls of the home may bring ticks and other pests directly into your living space. Take measures to discourage wildlife from exploiting your home, and pursue rational pest management strategies should you have a problem. To exclude rodents from entering, seal or cover holes or other penetrations in the home’s foundation, and ensure that the any spaces beneath exterior doors are protected with rodent-resistant door sweeps. Select ornamental plants that are not attractive to deer. Keep woodpiles and high grass or brush away from the home to discourage rodents (and their ticks) from thriving nearby. 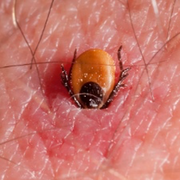 Certain acaricides (products labeled to kill ticks) can be applied to the property. Some of these products must be broadcast to the landscape, and may offer only transient benefits. Consider contracting with a licensed pesticide applicator who may know how to select and apply such products. Yet other acaricides are formulated into cotton balls. Some mice abscond with these treated products to line their nests. This may result in reducing the abundance of infected ticks on a property. Use an efficacious repellent: Certain repellents can be applied directly to skin or clothing; other formulations that are acaricidal and/or repellent can be applied to clothing. Select a product that contains an EPA-registered insect/tick repellent or acaricide, and use it according to the instructions on the label. When used properly, these products can provide a considerably level of protection. Consult with your veterinarian regarding what products may be applied to your pets. Proper use of these products can reduce the risks that your pets will feed ticks or transport ticks into the home. Note that products used on people should not be used on pets. Similarly, veterinary formulations should be used only on the specific kinds of pets as described on the label, and not applied to other animals or used on people. 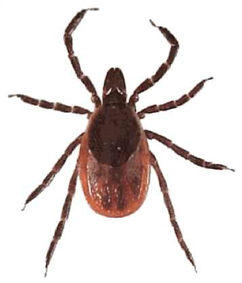 Check for ticks, and remove them without delay: Check yourself, your family and your pets carefully. The sooner you find and remove ticks, the greater the chance that you’ll reduce risks of irritation as well as tick-borne infection and disease. Exercise a routine nightly tick check (assuming you’ve had exposure to ticks). Save any tick and consider sending it to us for evaluation using our Specimen Evaluation Form. Contact your doctor: If you exhibit any rash, discomfort or other illness, or if you have any medical questions or concerns, contact your physician. Similarly, if you have your tick evaluated, do share and discuss the results with your doctor using the results supplied via the IdentifyUS Specimen Evaluation Form.